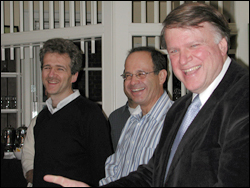 John Baras, (right) receives the best wishes of his friends and colleagues at the reception in his honor. ISR and ECE faculty, staff, students and friends honored Professor John S. Baras (ECE/ISR) with a special reception on Dec. 7. Earlier this year, Baras was elected as a Foreign Member of the Royal Swedish Academy of Engineering Science (IVA). IVA is the world’s oldest engineering academy. Its mission is to promote the engineering and economic sciences and the development of industry for the benefit of society. Baras was inducted at the Academy's annual meeting in Stockholm on Oct. 27.